There’s been a lot of wedding action going on at the Roslin Beach Hotel in Southend on Sea, Essex recently; they really are upping their game so far as holding gorgeous, luxury weddings are concerned there and went to town big time decorating their ballroom with the most amazing flowers for a photo shoot for their new brochure. It looked absolutely amazing and as Sticky Fingers Cake Co is their recommend wedding cake supplier, I was asked to supply an iced wedding cake, which Carla Boom, their in-house florist, decorated with white hydrangeas, “Avalanche” roses, lisianthus and (my personal favourite!) lime green guelder rose. In fact, all the flowers were white and green, which I personally think makes the decision making for couples much easier. Can’t wait to see the new brochure! 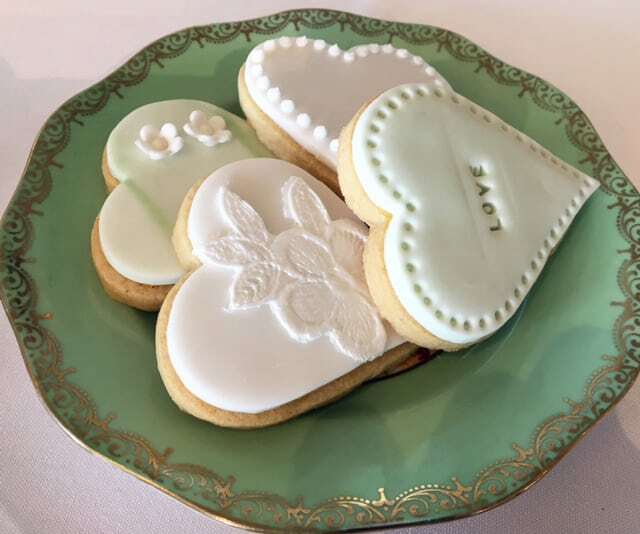 So with that in mind, as their wedding fayre was a couple of days later I decided to showcase lots of white and green wedding cakes, cupcakes and cookies. I introduced a new wedding cake called “Phoebe”, a 4 tier iced cake in white and pale green with eucalyptus blue sugar roses, which went down a storm! Continuing the green theme, I even wore my new sage green Converse trainers too – I’m so sad! The fair was a huge success. I always love exhibiting at the Roslin, it’s such a gorgeous venue and what a view from their ballroom too! I even met a couple organising their wedding for the Summer of 2020! (I do like an organised couple!) So, you know, it’s never too early..
We’ll be there again in October. I’ll have to see what other items of clothing I can match to my cakes haha! !